First there was the pumpkin spice sweet potato noodle waffle. Then there was the parsnaffle. 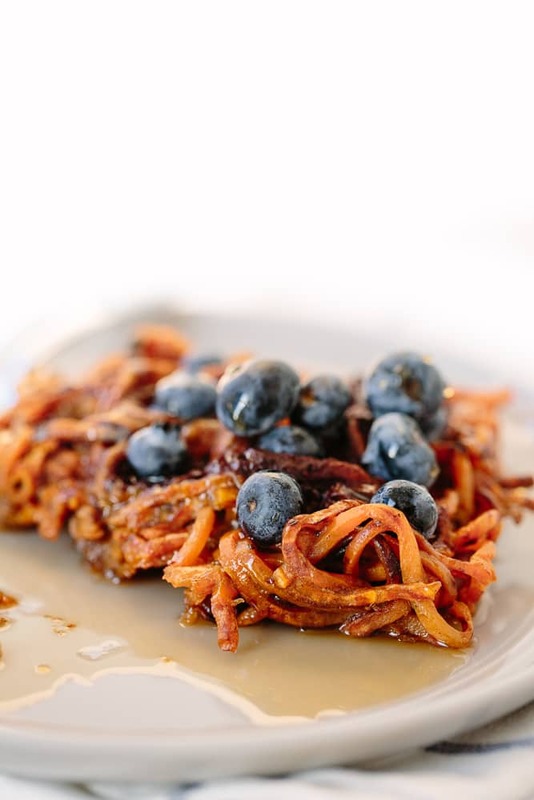 Now, there’s the spiralized dark chocolate sweet potato noodle waffle. 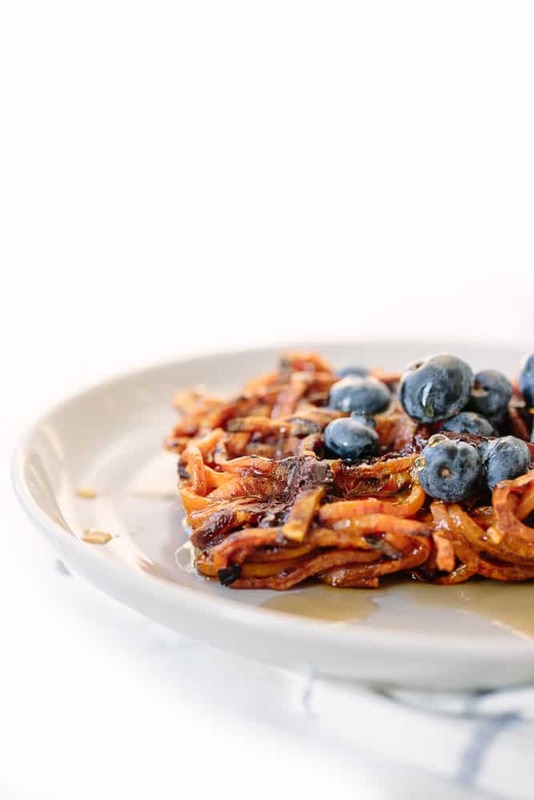 There’s something amazing about spiralized waffles, and I’m so happy to have been the first person to bring them to the Internet! I was always first in line. Guess I’ve always loved food! Or, carbs? I could devour a box of dry cereal in a sitting. I’ve done it. Luckily, now that I’m a mature, sophisticated woman (hehe), I’ve upgraded from Lucky Charms to spiralized waffles! Not only are these waffles clean eating friendly (they’re THREE ingredients), they are packed with flavor. 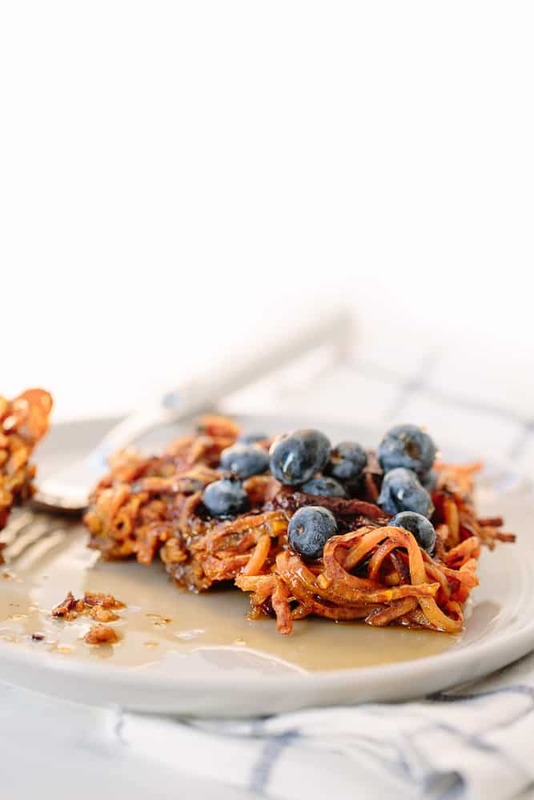 The sweet potato noodles cook with cinnamon first, so they’re infused with that subtly sweet, fragrant taste and then they’re packed into a waffle iron with dark chocolate for a sweetness that’s not overwhelming, just all kinds of right. And they’re only THREE ingredients! If you’re looking for an affordable waffle iron, I love this Krups belgian waffle iron – it gets the job done! I made these with ALOHA’s superfood chocolate – specifically, their Original Dark Chocolate flavor. 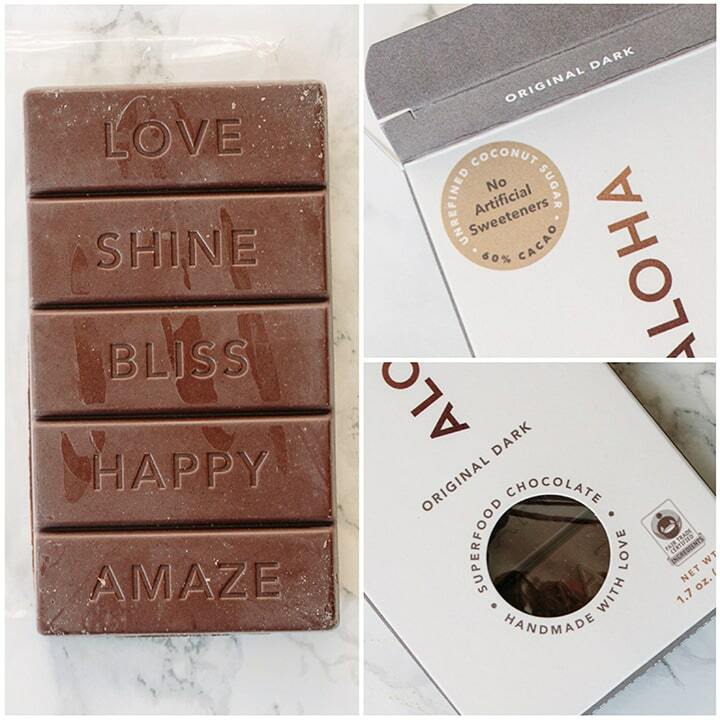 What I love most about ALOHA’s chocolate is that it’s vegan, gluten-free, non-GMO, soy and dairy free. Plus, while you’re eating chocolate, you’re packing in those antioxidants and nutrients! The ingredients for this chocolate bar are as follows: Peruvian Fair-Trade Raw Cacao Nibs/Beans, Balinese Coconut Sugar, Ecuadorian, Raw Cacao Butter, Daily Good Greens Chocolate, Philippine Raw Coconut Flakes, Vietnamese Raw Cashews, Tahitian Vanilla Bean. It’s no secret I love ALOHA, and these waffles are just another reason to love them. Actually, last week, I came home and really was craving some chocolate, and I broke open their Macadamia-Coconut bar and ate half of it and didn’t feel a sugar-high or any of the bloating you feel when you eat, say, a thick, sugary milk chocolate bar. I just felt my sweet tooth satisfied! Heck, it’s the holidays! What better time than to treat yourself or gift someone some delicious, thoughtful, healthy chocolate? I am totally making these waffles for my family on Christmas morning this year, or sometime during that holiday week – I’m so excited! I think I may start a family tradition once Lu and I have kids. optional, to top: maple syrup, blueberries, pecans, etc. Place a large skillet over medium heat and add in the olive oil. Once oil heats, add in the sweet potatoes and season with salt and cinnamon. Toss and cook for about 10 minutes or until noodles are cooked through. You can cover to cook more quickly. Transfer the noodles to a large mixing bowl and add in the egg and chocolate. Toss to combine. Spray the preheated waffle iron with cooking spray and pack in the noodles carefully. You may have to play around with the noodles to get them to fit in all of the grooves. Cook the waffle according to your iron’s settings. When done, carefully remove the waffles and transfer to plates. Top with any toppings you’d like, but don’t forget the maple syrup. Chocolate..... Cold, warm, melted, dipped, covered .....it's ALL good! I love chocolate, by itself, slowly melting in my mouth. To savor one piece of dark chocolate slowly, first inhaling its fragrance and then letting it melt until it disappears into a memory. Just a piece of dark chocolate with sea salt is sooo good. This looks delicious! I would love to make this for a sunday breakfast :) My favorite way to eat chocolate is either plain via a yummy holiday chocolate bar (like pumpkin spice and almond that i'm currently eating) or via a spoonful of sun butter and chocolate chips. I love chocolate all by itself - or melted over something, or melted into something - or yes - just all by itself! I'm a purist, like my dark chocolate straight. I enjoy some chocolate when I get a craving that will only be satisfied with some chocolate. Then I usually give in & treat myself to some delish tasting chocolate! Nothing compares to good chocolate! I love chocolate melted and drizzled on fruit! I've been noticing Aloha online lately but didn't know much about it. Now that I've read your post I've gotta find me some! (Or win it! Hehe). It sounds perfect since it's sweetened with coconut sugar. Thanks for the info! Hi Ali, My computer is running very slowly these days and I've just sat here for 5 min. watching the cookies from your site load on to mine. I've enjoyed your blog so much, your creativity , your healthy attitude, your enthusiasm. Really, you are such a pleasure. But things have changed. The huge amount of cookie are a problem, even your header: the inspiralizer, the cookbook, "Shop", get started on YOUR machine. I purchased a spiralizer because of you and your blog, but since your version came out it's harder to follow the recipes because they're focused on your own product. Your site has become a merchandizing technique, and your blog reads like an ad. I have been so impressed by your daily recipe. What a lot of work you must do, because they're all GREAT! But there are clear differences between merchandizing sites and blogs and you've changed sides. I'm sorry to see that. Sorry to hear you feel that way! If you don't feel like the information I offer anymore isn't for you, feel free to remove it from your bookmarks! 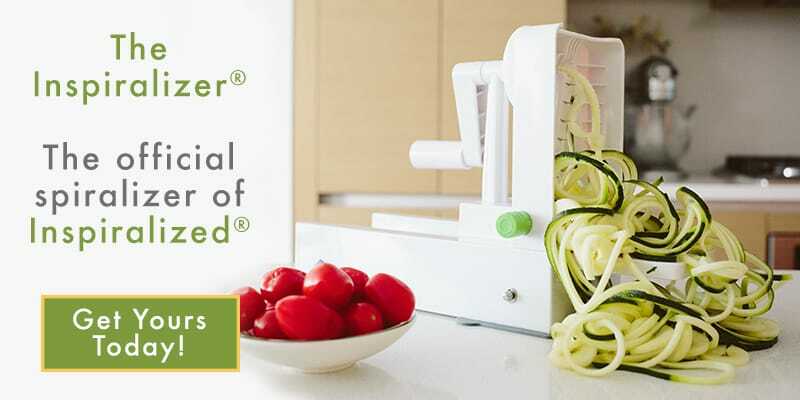 I work extremely hard to bring brand new recipes each week, while offering a product that far out-performs the rest for a much better spiralizing experience (as I'm having). If it wasn't for things like ads or sponsored posts or my products, I wouldn't be able to bring everyone this fresh content so frequently - these are sources of living for me, which make it possible for me to continue this blog. Sorry to hear you won't be enjoying the site anymore! I love the food; I love the website. That's all. Yay!!! I don't think I've ever had chocolate for breakfast..........yummy! I enjoy eating my chocolate by itself, or with a cup of coffee. And chocolate chip cookies are my weakness! Can't wait to try these waffles - such a creative recipe! In ice cream! But this sounds really delicious too. I'll eat chocolate in any way, shape, or form! I love chocolate at the end of a stressful day. Ally, Also on another note, I love your recipes, but always have to write the nutritional info on them. Have you ever thought about adding it to the bottom of the recipe like a few other blogs do? these look amazing! my favorite chocolate is dark chocolate, 85%, with a small glass of red wine, usually about an hour or so after dinner. definitely going to try these though! I can't wait to try these at Christmas time! Not just chocolate for breakfast, but chocolate combined with spiralizing, my boyfriend's family are in for a treat!! I love chocolate WAYYY too much to choose which one I like the best!! Although this recipie may be a new favorite ;) will try soon!! Looks soooo good! Waffles and chocolate are the perfect combination! I would love to try this chocolate! I love my chocolate organic and VERY dark. Also chocolate covered candied ginger! Chocolate covered candied ginger sounds amazing! Thanks for sharing! Haha!! That added ingredient can be our little secret. ;) But these waffles will make eating healthy fun and rewarding. No chocolate fudge sauce required. I love chocolate in cake! Or brownies! We love a good chocolate brownie. Have you tried the zucchini noodle muffins with chocolate chips? It sounds like you'd love it! My favorite way to enjoy chocolate is OFTEN! Right?! This recipe was made for you! I love dark chocolate! I eat chocolate sparingly, but I love to add dark chocolate cocoa powder to oatmeal, smoothies, pancakes, waffles, peanut butter...pretty much anything I can. Smart! We love quick and healthy ways of getting something a little extra sweet in our life. Thanks for sharing. I like my dark chocolate straight up plain or with a swipe of peanut butter on top. Yum! The ultimate open faced sandwich! I love dipping a chunk of chocolate in the peanut butter jar!! Yes!!! We love this. No spoons required. Eating it straight up - letting a square just melt in my mouth, the darker the chocolate the better! Totally agree!! Letting a square of dark chocolate melt on your tongue is heavenly. I eat a square of dark chocolate every night before bed! It satisfies my sweet tooth but doesn't weigh me down. I'd love to try Aloha! You would LOVE Aloha!! It's a must, especially for those of us who love our chocolate. I am totally making this tonight! I love chocolate every way! But I have especially been looking for healthy chocolate for my health issues since most chocolate is full of soy and/or GMO. I would absolutely love to try Aloha chocolate!! It sounds like "just what the doctor ordered!" 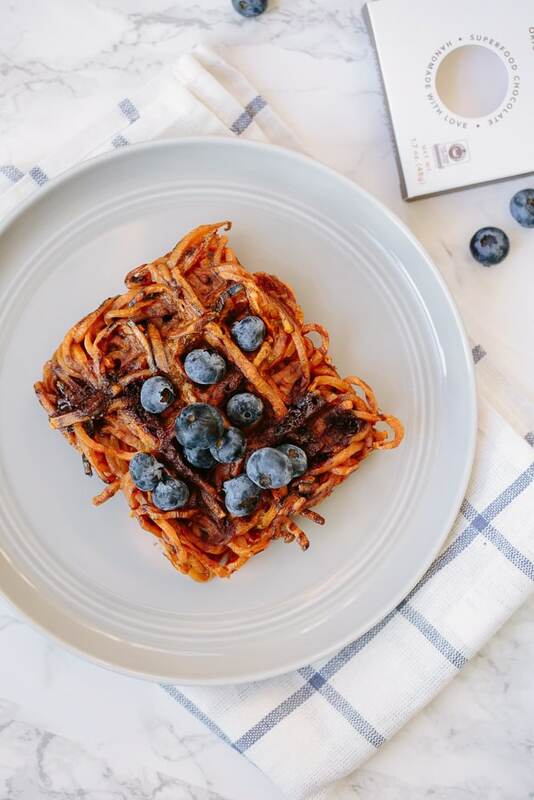 In a little way, I agree with Janet T but if it hadn't been for Ali and the spiralizer Blog and info, I would not have found out about this new way of eating. I was never a great fan of courgettes (zucchini) but now I buy them every week plus sweet potato, turnips etc and I now also look out for other veg like kohl rabi which I had never tried. I eat more chicken and fish now because I can make more exciting dishes as sides with my spiralizer. I still use my favourite recipes but replace most of the old carbs. So although I understand where Janet T is coming from, I will still continue to print out the recipes and use them because they work for me. I totally need to try this! What a brilliant idea! Can't wait to try! Have to go with chocolate covered strawberries! Mmmmm chocolate -- love it! Super dark is sooo good and I love it with ginger so good! This waffle recipe sounds divine! Love my chocolate with cheese and baby dills. My new favorite way is melted dark chocolate on gluten free crepes. With whipped coconut cream. I love chocolate plain or with fruit and in winter I love a cup of (dairy-free) hot chocolate, even better with marshmallows! Can you use a flax egg in place of the egg? Give it a try! 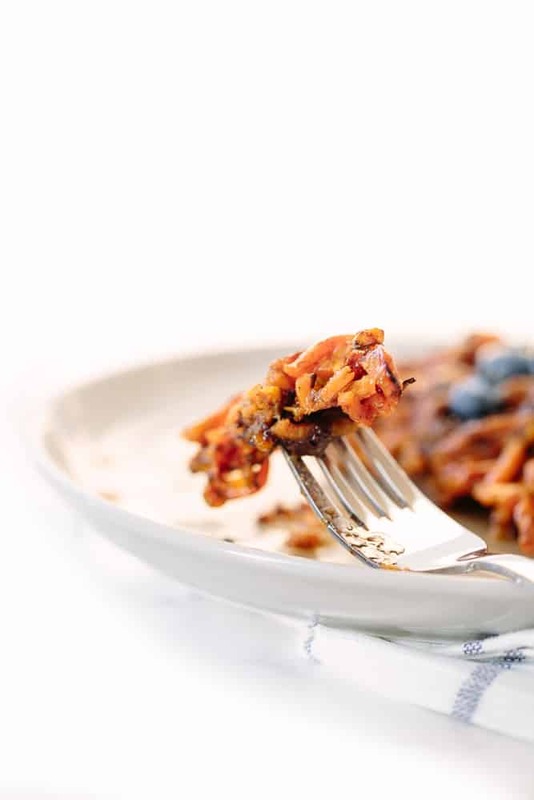 We haven't used a flax egg before with this recipe but it should work! We always encourage experimenting! Let us know if you do!